In a world where produce routinely travels thousands of miles from harvest to plate, fresh figs remain a seasonal luxury. The sweet, chewy fruit is exceptionally delicate -- its ultra-short shelf life is why the vast majority of figs are dried before they’re brought to market. 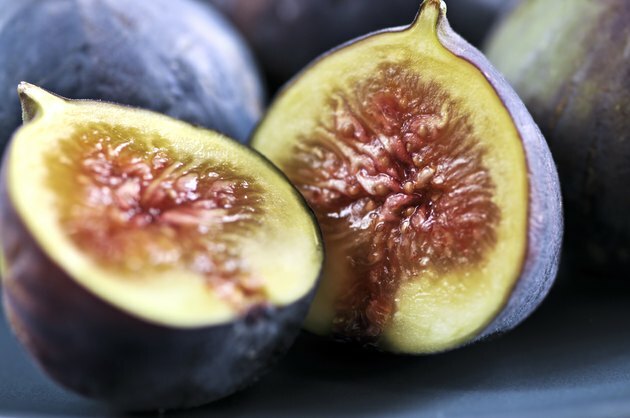 A medium-sized fresh fig -- or one that weighs a little less than 2 ounces, according to the U.S. Department of Agriculture -- has just under 40 calories. You’ll get about 30 calories from a smaller fruit, while a larger one supplies close to 50 calories. One medium fig provides about 10 grams of carbohydrates, less than half a gram of protein and very little fat. Simple sugars account for roughly 85 percent of the carbohydrates -- and therefore most of the calories -- in fresh figs. Most fresh fruits provide right around 100 calories per serving. The standard amount for a single serving of fresh figs is three medium-sized fruits, an amount that delivers about 110 calories, 4 grams of fiber and 10 percent of the daily value for potassium.